TMD Creative Archives - The Marketing Department, Inc.
TMD is proud to be a sponsor of the Fifth Annual Salinas Valley Ag Tech Summit. Hosted by Hartnell College’s Agriculture Business and Technology Institute in collaboration with the Monterey Bay Chapter of the California Association of Pest Control Advisers (CAPCA), the event will take place on Wednesday, March 28, 2018 from 8:00 am to 5:30 pm at Hartnell College’s Main Campus located at 411 Central Avenue, Salinas, CA. Two educational tracks are specific to continuing education credit hours in the areas of laws and regulations, new technologies for pest management, aerial Ag tech, understanding bee behavior/vulnerability, increasing student interest in related Ag careers, and much more. A third educational track addresses overarching Ag technologies with respect to rural broadband, food safety, robotics and ergonomics, mechanization, and harvest assist technologies. In addition to the three educational tracks, the event will feature an all-day trade show and Ag tech product/service demonstrations. Included in the trade show will be the Monterey CAPCA’s booth featuring an internship and job portal for employers seeking new employees/interns and students seeking jobs or internships. A pitch competition room is also available for those with new Ag tech ideas and/or start-up companies looking for investors and implementers. Dr. Bob Whitaker of the Produce Marketing Association will lead off with the morning keynote presentation and Robert L. Gunther of United Fresh Produce Association will provide the afternoon keynote presentation. Admission to the event is free and includes a sponsored lunch. Growers, PCAs, CCAs, QALs, pilots, students, growers, and members of the Ag tech and software industries are encouraged to attend. Agriculture professionals with PCA, QAL or QAC certifications will receive ongoing education credits by the Department of Pesticide Regulation for attendance. Our team encourages you to join us, and register for the event here. TMD Creative was approached in the spring of 2015 with an interesting idea: starting the first tradeshow solely dedicated to fresh organic produce, now a $14 billion dollar industry that continues to grow. There have been numerous tradeshows focusing on organic food, but none that have focused exclusively on organic fruits and vegetables. As an experienced marketing firm in the agriculture industry, TMD Creative quickly became a member of the Organic Produce Summit team, presenting the inaugural show in July of 2016. It was an instant success, selling out weeks in advance, and hosting a large number of exhibitors, retail buyers, and heavyweight keynote speakers. Organic produce companies from across the country exhibit their products at the annual Organic Produce Summit. The team from Bako Sweet is featured above. The second annual Organic Produce Summit needed to build off the momentum of the first, while attempting to increase the size of the event. The original plan was to move the show to the new Monterey Convention Center in order to accommodate the larger number of attendees and exhibitors. The Convention Center was under construction when we agreed to terms with them, and was supposed to open in the spring of 2017. However, as construction delays mounted, we pushed the team at the Convention Center on their ability to host the event. We quickly moved to a backup plan, and ended up at our original location at the Hyatt Conference Center, the largest event space available in Monterey with the new Convention Center still under construction. In order to attract a larger group of organic produce growers this year, we needed to entice a large group of high volume, well-respected buyers. And in order to attract these buyers, we needed an outstanding group of industry thought leaders that would speak and engage in TED-style talks, in addition to educational sessions presented by keynote speakers. We also offered incentives to the buyers, like complimentary airfare and lodging. The Hyatt Conference Center could hold over eighty 10’ x 10’ exhibit booths, and we had planned on having 950 attendees. 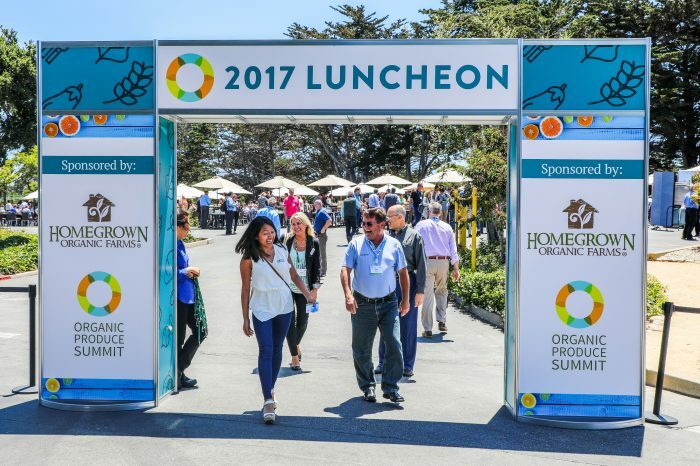 While the location was being secured, TMD Creative began to work on branding the Organic Produce Summit, updating their website, and marketing the show to the fresh produce industry through press releases, e-blasts, print and digital ads, and social media. 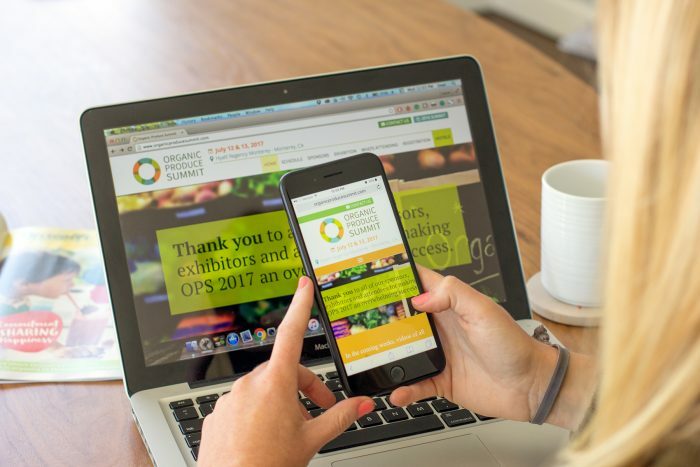 TMD Creative designs responsive website for the annual Organic Produce Summit. The show sold out again this year with a 45% increase in attendees and 30% increase in the number of exhibitors. Revenue rose over 50% compared to the first year, and budgets were adhered to, keeping costs close to first-year levels. Buzz for the event grew quickly. 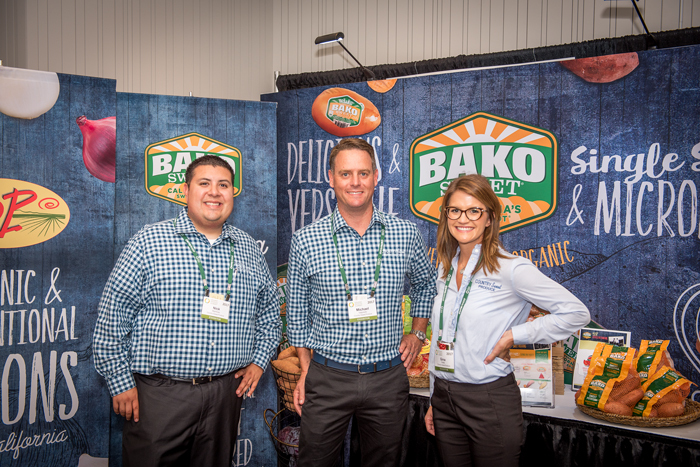 The Organic Produce Summit team wanted to differentiate themselves from other tradeshows by promoting their sponsors in unique ways. TMD Creative developed a series of algorithms to show sponsors their AVE (Average Value Equivalency), or the value of the advertising and public relations exposure they received for their sponsorship. Since the first show debuted in 2016, TMD Creative has been responsible for developing and implementing these algorithms, creating a viable formula for calculating the value of the various mediums that were being employed to promote the event. TMD Creative designs exterior and interior signage for the Organic Produce Summit. As soon as the updated website was launched, it immediately cultivated registrations from growers, buyers, and organic produce companies interested in exhibiting their products. Our marketing campaign targeted buyers first through a mix of e-mail newsletters and customized ads. We then focused on attracting exhibitors and growers. Hundreds of people were turned away in the final month, as the Hyatt Conference Center had reached its capacity. To prepare for the show, TMD Creative designed and produced signage, media presentations, and printed programs. Post-event advertisements were also created to thank sponsors for their support, and surveys were sent to attendees to gather feedback. 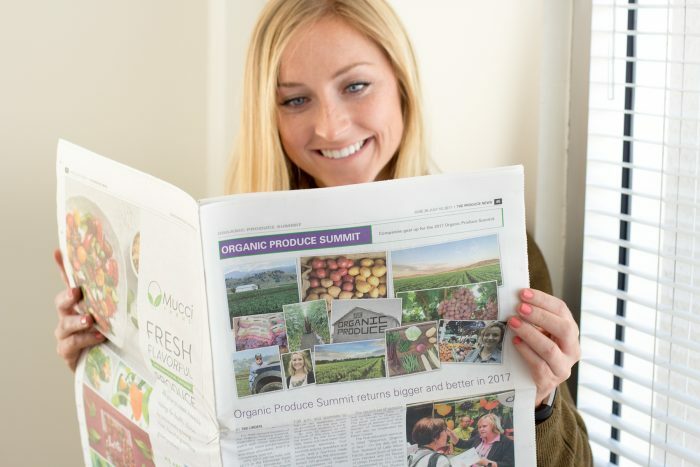 The sold-out Organic Produce Summit garners press from industry news outlets across the country. The annual Organic Produce Summit sold out again in its second year, successfully engaging members of the fresh produce industry from across the country. Post-event surveys have shown there is a high level of satisfaction among attendees. The event has garnered positive press on a national scale, inspiring industry news outlets such as And Now U Know, The Produce News and The Packer to publish articles. Due to its success, plans are underway to move the show to the new Monterey Conference Center in 2018, a larger venue located in downtown Monterey. Below are the rules and regulations for the transportation survey we are conducting. The winner must be a resident of South County and be 15 years or older. One winner will be randomly selected from participants who fill out all 19 questions. The winner will receive a $250 Visa Giftcard! 1. Entrants must send entries as required in the contest announcement in order to be eligible. Entries received after the deadline set forth in the contest announcement are ineligible, null, and void. TMD Creative and Chidlaw Marketing will not be responsible for and will not consider incomplete or incorrect entries. TMD Creative and Chidlaw Marketing are not responsible for entries that are sent, completed, or filled-out, but not received for any reason. 2. All winners will be notified by the form/method of contact they provided in question number 19, when they initially entered the contest. Contest must either be entered online, or from designated businesses and organizations within South County that will have hard-copy surveys. If the winner does not respond to the notification within: a) five (5) business days for contests entered via a hard-copy form or online survey another winner will be chosen. Failure to respond within the time frames listed above shall mean that the provisional winner forfeits the prize. The winner will be contacted by either email or by phone (or both) as requested in question 19. This information will not be used for anything other than to notify the winner. This is an anonymous survey. 3. Only one entry per person will be considered for contest entry. 4. This contest is open to any resident who lives between Bradley and Spreckles along the 101 corridor, and is age fifteen (15) years or older. 5. If a winner is someone who either does not live between Spreckles and Bradley on the 101 corridor (often referred to as “South County”), and/or lists a city within this area, but does not actually live there, they are not eligible for the prize. The fastest way for Produce Companies to respond to food safety breaches or product recall incidents. The FDA and USDA report that on average, 30 recalls occur every week in the United States. When recalls happen, there is a tremendous amount of uncertainty and sometimes panic from consumers, as well as public demand from consumers for companies to not only fix the problem but compensate affected consumers. The level of public awareness has increased significantly with the advent of social media. Being prepared is your best defense and offense if and when your company is faced with a product recall. TMD Creative has extensive experience in helping leading food producers deal with such situations. There are several things we encourage all our food producing clients to do in order to be ready to respond to such crises. Establish a rapid response team within your company including TMD as your website communication partner. This includes developing an early warning monitoring system that looks for early signs of product complaints and failures. Develop a toolkit to help guide a rapid response. Train managers and identify people within the company who will approve statements and posts to your website and social media. Ask TMD to create a produce recall page on your website to remain hidden from view so you will be ready to respond if required. Establish clear lines of communication from production to sales and marketing. Develop an on-call protocol that includes sales, marketing and external communications partners like TMD. Channel all final communications through one person within the company to outside vendors. Your social media posts should be coordinated in the same way your communications with the media and or government officials are coordinated. Develop an internal clearinghouse for potential posts. Establish a team of social media monitors to track and respond to consumer comments and concerns. After you get information distributed and posted through the right channels, establish a regular response cadence. There is no need to respond to everything, but identify the types of responses that keep lines of communications open with consumers. Allow fans to continue to post and provide them a forum to engage. If you go on lockdown it’s likely to create a story in itself and could lead to a missed opportunity to engage stakeholders. Recalls create brand uncertainty and can cast a negative light on a company. However, if handled professionally, a company’s response can reinforce brand affinity and give you a competitive advantage. TMD Creative has solutions that will make your response to such uncertainties go smoothly and help you to retain your terrific reputation that you have worked so hard to build. Call Nick Pasculli to get started today and avoid the confusion that product recalls can create.